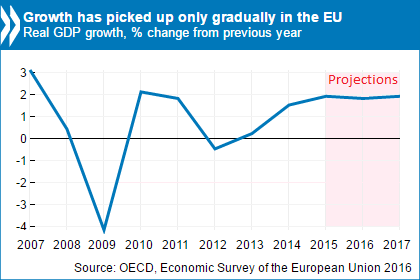 10/6/2016 – The European economy is gradually recovering but further policy action will be required to address unresolved legacies of the global economic crisis that are weighing on growth and major new concerns that have emerged, according to two new OECD reports. Easing financial constraints would bring benefits across the economy, notably to private sector firms considering future investment plans. This will require addressing one of the legacies of the crisis – the resolution of non-performing loans in many countries, which threaten financial stability and act as a drag on bank credit. Waivers could be applied to the new Bank Recovery and Resolution Directive rules to help put in place government-supported schemes when non-performing loans are a serious economic disturbance, the Surveys said.